Venetian glass is form of fine glassware produced, developed and refined over many centuries in Venice, Italy, primarily on the islands of Murano. This one square kilometre group of island to the north east of Venice remains a world-renowned centre for colourful, elaborate art glass of the highest quality and craftsmanship - be it in beads and jewellery, chandeliers, glassware, mirrors or other decorative objects. The first documented record of Venetian glass production dates back to 982 and references a Master phial and bottle maker named Dominicus Phiolarius. A further reference in 1090 mentions a Petrus Flabianicus (or Peter of the Flacons), involved in the same activity. However, pre-dating this documentary evidence, by some 450 years, archaeological discoveries made in the 1960s suggest the presence of glass workers and furnaces in the Venetian lagoon, centred around the island of Torcello and also Aquileia on the mainland. These sites appeared to be primarily focused on producing glass tesserae (from the Greek meaning ‘four-sided’) which were small glass or stone squares used as mosaic tiles for decorative purposes, possibly to be used in local churches or the villas of wealthy noblemen. This process harks back to far earlier production techniques from the Roman Empire when moulded glass was used to bring light into bathhouses. Several centuries were to pass before the artisans of the Venetian area embarked on what was to become a fully-fledged and unique period of decorative glass production, evolving over time to reach world renown and for a period a virtual monopoly industry in Europe. This shift in emphasis was largely due to Venice’s growing status as a cultural bridge between the west and the east. This was based on its geographic location on the Adriatic - facing the Balkans, and with the Middle East and Asia to the south and east respectively. In addition it was strategically well appointed on a series of islands with a strong navy and merchant fleet and had a devotion to trade, and the grandeur and influence that trade brought them. This role was initially focused on those countries bordering the Mediterranean, but also embodied the Holy Lands and the Orient. In war and peace the Republic of Venice focused on commercial advantage be it negotiating exemption from duties when trading in Byzantium in the 11th century, or the creation of trading bases, or protected ‘colonies’, in the Holy Land and Central Asia in the early 12th century. This policy was to give the Republic of Venice near monopoly status in glass production across Europe for some 300 years. As hinted at above, glassmaking was very much an Eastern skill, and glass-making traditions were already well established in many countries in the Middle East, including Egypt, Palestine and Syria. Although Venice was influential in these regions, Islamic glass didn’t have any great presence in Venice until the capture of Constantinople in 1204 by the Crusaders on their 4th Crusade. This resulted in an influx of fleeing Byzantine glassmakers into Venice bringing with them skills and techniques that were totally new to Europe. By the end of the century, Venetian glassmakers had adapted many of these imported processes, alongside their own, to obtain unique results. This influx of techniques was to be repeated again in 1453 when Constantinople fell to the Ottomans. Political and commercial expediency then played an important part in ensuring that these techniques were retained within Venice and production was regulated to maintain a competitive advantage. In 1271 a legislative edict (or capitulary) was declared with the sole intention of regulating the art of glass making for the purposes of commercial advantage. From this point forward the importation of foreign glasswork into Venice was forbidden and foreign glassmakers were prevented from working in the city. In 1291, the small independent art glass factories that were now starting to flourish in Venice, in particular around Rivo Alto and Dorsoduro, were moved across the lagoon to the island of Murano where they were to remain to this day. This was enforced relocation was ordered by the Maggior Consiglio or Great Council. During the Middle Ages and the Renaissance period this was a political organ of the Republic of Venice, made up of adult males from the aristocracy with a life long hereditary right to sit on the council. It functioned mainly as a pool from which members could be drawn for other councils and committees of State, such as the Senate, and the more secretive Council of Ten (established 1310), all under the chairmanship of the Doge. 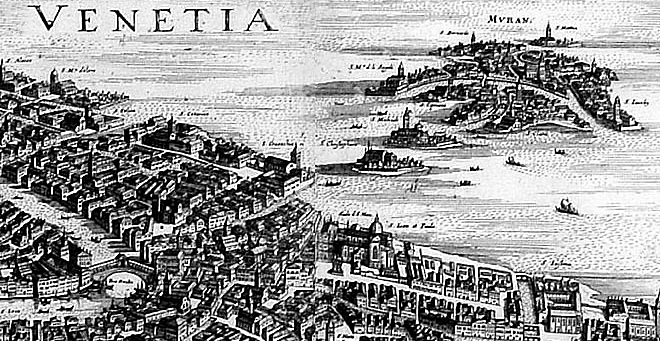 A section from a larger view of Venice with the island of Murano in the distance (circa 1600 attributed to Danckerts in the style of the famous woodcut print by Jacopo de'Barbari circa 1500). The stated aim of this measure was one of safety due to the risk of furnace fires engulfing the over populated Doges city, which was largely constructed of wooden buildings. In part this would be a sensible precaution, but it also served to keep production isolated away from the prying eyes of competitors. A further indication that this may be the thinking behind the declaration is to be found in the fact that the mirror makers, who also made use of furnaces, were allowed to remain in the city. Four years later another capitulary made this reasoning more blatant as the emigration of Venetian glass makers abroad was expressly forbidden. To insure that the glassmaker’s secrets were never revealed, harsh sentences were to be meted out to individuals who leaked secrets to foreign nationals, or left Venice without official permission. It was also rumoured that the Maggior Consiglio even hired assassins to capture or kill artisans who left the island. Those that did leave were forbidden in their absence from ever working in the glass making industry of Murano again. However, as we will see later many craftsmen did take the risk and setup furnaces in surrounding cities and as far afield as England and the Netherlands. 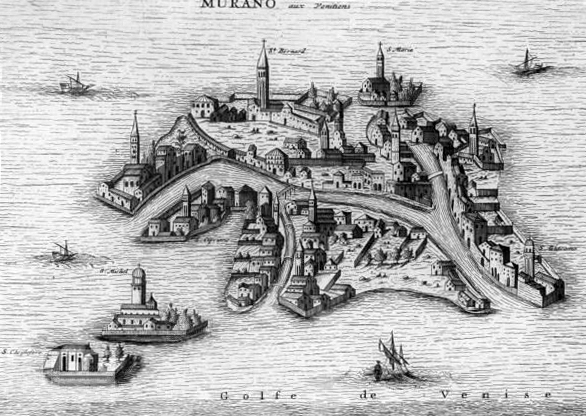 A detail from an unattributed engraving showing the island of Murano. On Murano, as they had done with the Arsenale (the fortified complex of state owned shipyards which at its height occupied some fifteen percent of Venice), the Venetian authorities aimed to guard what was now seen as a vital industry by keeping it in isolation - albeit in a gilded cage. Incentives and conditions for employees were regulated by the Guild set-up to control the glassmaking industry. The Guild of Glassmakers, Ars Fiolaria, established in 1224, came under the direct authority and protection of the Republic of Venice. The positive result of this direct management and the concentration of the glassmakers in a single location was a cross fertilisation of ideas and techniques, and an increased artistic fervour, which quickly made Venice the principle glass producer within Europe. In turn, Murano's artisans were proffered a new social standing in Venice. By the 14th century, glass makers were allowed to wear swords, enjoyed immunity from prosecution by the Venetian state, and found their daughters married into Venice’s most affluent families. Through this clever approach, the Venetian Republic ensured that the glassmakers encouraged their offspring to carry on the trade, ensuring that trade secrets stayed within families further fuelling the creative process leading to greater innovation and commercial success. As anticipated these glass recipes or partite became highly prized and were kept strictly secret, handed down from father to son and transcribed into secret books. For example, Antonio de Pisa of Murano passed on detailed instructions on the use of lead compounds for producing lattimo or milk glass. It was a formula that became an important and profitable product for the Venetians. Milk glass provided Venice with a cheaper substitute for imported Chinese porcelain, which was so prized within Europe. Over the next 500 years, through further edicts and management through the Guild, political rule would ensure quality controls, introduce raw material agreements, and provide enhanced trade protection from foreign competitors as required. This direct approach, along with Venice’s location at the crossroads of trade between East and West, gave Venice monopoly powers in the manufacture and sale of quality glass throughout Europe that was to last for centuries. Although dating back to biblical times (and in particular the Book of Exodus 28 and 39), the custom of wearing Birthstones in Europe probably first became popular in Poland in the 16th Century. By the 17th Century, gemstones had become firmly associated with specific months of the year. Wealthy members of European society would wear each months stone over the course of that month in order to be in harmony with the celestial spirits. As the months changed, the wearer hoped the stone would bring them the special properties associated with each particular celestial period. For instance, Garnet would bring the wearer tranquility, protect against fevers and also against harm during travel. Whilst Ruby would bring clarity of mind and protect against harm from natural causes. Ultimately this meant that each individual would have to invest in a set of twelve gemstones and an item of jewellery with which to wear them. By the 18th century, probably as a financial necessity, members of society began wearing only the gemstone that represented the actual month of their birth. Nowadays a Birthstone is usually offered as a gift to symbolise the qualities attributed to the month of birth of the recipient. For historical, national and commercial reasons there are actually more than twelve birthstones and the actual number depends on the Birthstone Chart that you choose to use. Below you will find the Official British Birthstone List and the Official American Birthstone List along with an indication of whether the birthstone bead or gemstone selection is a Traditional Birthstone, a Modern Birthstone or an Alternative Birthstone. Each entry comes with a brief description of the traditional Birthstone Meanings as well as Birthstones Colours Chart. For a wider understanding of the gemstones included in the list of birthstones for each month of the year we have provided a link through to our Gemstones and MInerals Guide for each Birthstone. This gemstone glossary provides the physical characteristics of each stone along with colour variations, sources, history, purported therapeutic properties, and the traditional meanings of gemstones. The Curious Lore of Precious Stones by George Frederick Kunz . . . a compendium of all the powers that have been associated with gemstones through the ages.